Y’all a dessert dip is one of the best things in life. They are easy to make and oh so good! 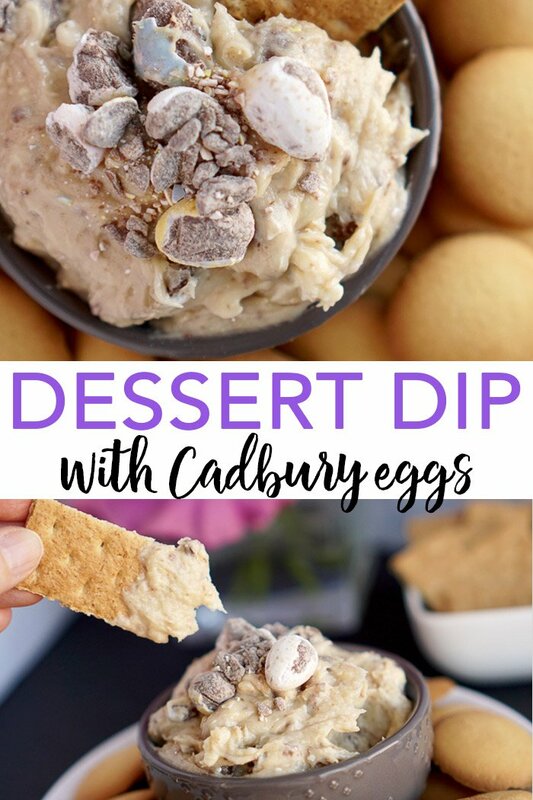 Add on Cadbury chocolate eggs and you have one gorgeous cream cheese dessert dip to serve up this Easter. You can serve dessert dip with graham crackers, vanilla wafers, pretzels, or even fruit. I am dropping one of my favorite recipes below. Y’all be sure to try it this spring! Mix butter and cream cheese until smooth. Add brown sugar, powdered sugar, salt, and vanilla to the butter and cream cheese. Then mix well. Chop Cadbury eggs and save some for garnishing. Fold in the remainder of the chopped Cadbury eggs. Garnish top with reserved chopped Cadbury eggs. Serve with graham crackers, vanilla wafers, pretzels, or fruit. Don’t you just want to dive right into a bowl of this dessert dip? I mean it looks oh so good! I don’t know about you but I am infatuated with dessert dips right now. They are so good and the easiest way to feed to a crowd. This makes them perfect for holidays like Easter and more. You might even want to pick up additional packages of Cadbury chocolate eggs while they are at the store. 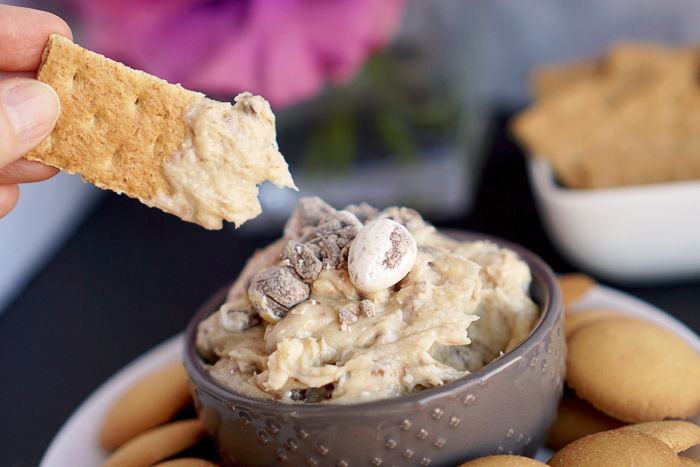 This may be one cream cheese dessert dip recipe that you want to make all year long! You can absolutely substitute out other chocolate candies or even chocolate chips in this recipe as well. 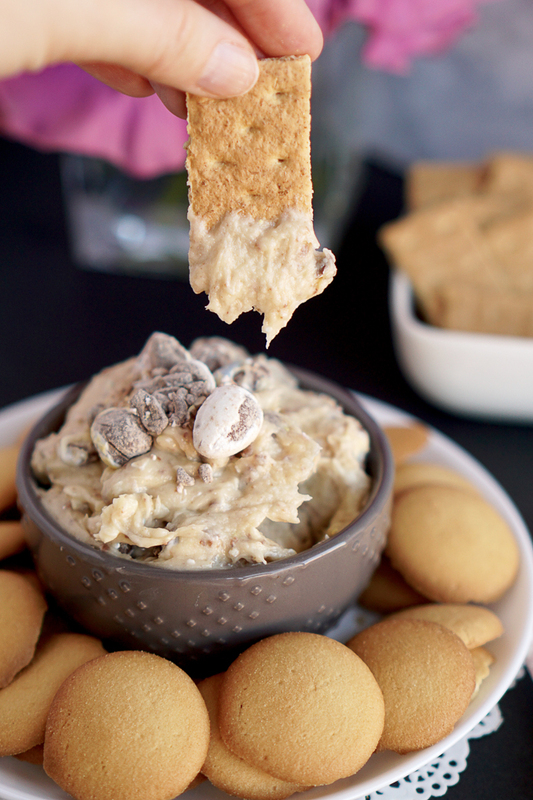 There is nothing better than dessert dip with graham crackers served up for any occasion! 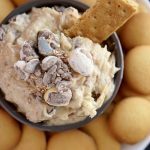 Love dessert dips and want more recipes? Try the links below! Want to print the recipe for this dessert dip with graham crackers? Try the recipe card below!